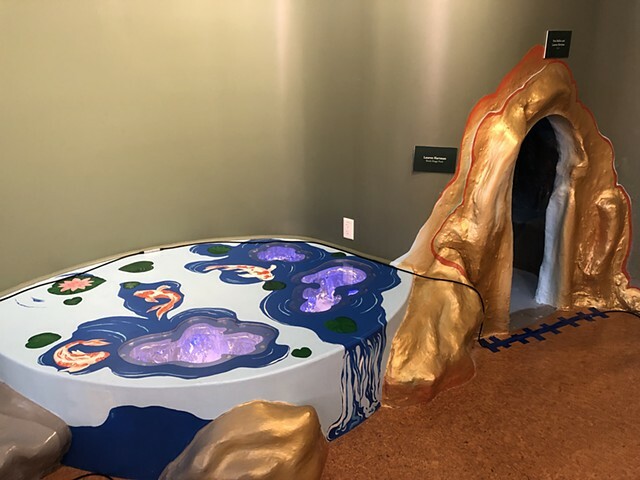 This immersive installation is part of the Enchanted forest theme of the newest 826 Valencia After-School Tutoring Center. The center services Mission Bay neighborhood students ages 8-18. Our aim is to explore the many facets of submerged culture. We Bring together historians, explorers, archeologists, swimmers, artists, underwater enthusiasts, and sailors. The Society of Submerged culture is a membership-based organization striving to shine light on archeological discovery and catalog the many layers of history in San Francisco, and along its coastline. Membership is open and free to all whom are dedicated to the advancement, research, and education of submerged culture. Collecting and documenting artifacts for our growing archives helps us uncover the stories of our surroundings.